Identify sub-parts of models so that you can get a handle to and manipulate them in your script. View polygon and texture information for the model and sub-parts. If the model is negatively affecting performance, this can help you determine the cause. Move, rotate, and scale the model and its sub-parts. 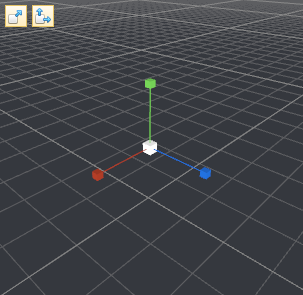 Add, delete, and move nodes within the scene graph. Edit model properties such as node names and colors. Navigate around the model and copy the 3D position of points on the model and camera information. This is useful for positioning objects and setting up the viewpoint in the Vizard script. There are several ways you can load a model into Inspector. 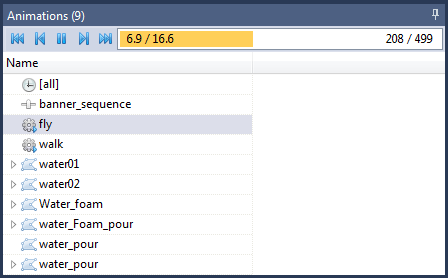 In the Resources pane of the Vizard IDE, right click on the model name and select properties. Drag and drop a model file onto the Inspector icon. 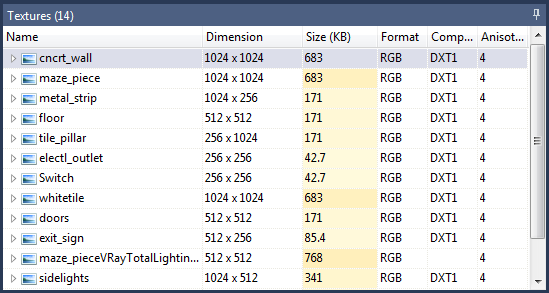 Browse to the file from within Inspector by selecting File > Open. Rotate: Hold the left mouse button down, then drag to rotate the camera around the current rotation pivot. The initial rotation pivot is set to the center of the models bounding box. 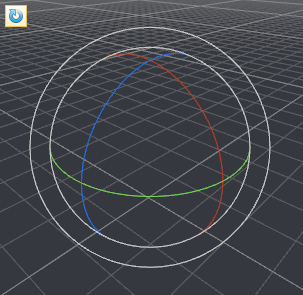 That rotation point can be set to be any model sub-part by double clicking that part. Zoom: Scroll the mouse wheel to zoom the view in/out. This will essentially increase or decrease the distance to the rotation pivot. Pan: Hold the right mouse button down, then drag to pan the camera relative to the current orientation. Dolly: Hold both the left and right mouse buttons down, then drag up/down to move the camera forward/backward relative to the current orientation. The distance to the rotation pivot is not changed. Set Pivot: Holding the shift key while clicking the left mouse button will set the rotation pivot point at the selected intersection point. The distance to the rotation pivot is not changed. Use fullscreen mode to expand the view of the model and help with navigation. Pressing F2 will toggle fullscreen on the monitor the Inspector window is currently inside. When in fullscreen mode, Inspector will display only the view pane and hide all other UI components (i.e. menu tabs, toolbars, panes, etc.). By copying 3D position and camera data you can easily position objects and set the viewpoint where you want it in the Vizard scene. Right click any point on the model and select Copy 3D Position to copy the 3D coordinates of that point to the clipboard. Right click any time while navigating in the viewport to copy data about the current camera position and orientation. Single click a name in the tree to display a selection box around the corresponding sub-part in the viewport. Double click a name to select the part, center it in the viewport and set it to be the rotation origin. Single or double clicking a part in the viewport will have the same effect as described above while highlighting the corresponding name in the scene graph tree. Polygons: The number of polygons within the node and its children. Poly %: The percentage of all the polygons in the scene within the node and its children. Textures: The number of textures applied to the node. Clicking will display a drop down list allowing to select and display a texture. Description: The number of descriptions applied to the node. Clicking will display a drop down list allowing to select and display a description. Node: The base type for all nodes in the scene. Transform: A node that has position, orientation, and scale information. Animated Transform: Supports animations based on translation, rotation, and scale. Geode: A node that contains geometry and other drawable objects. Geometry: Triangles that form the frame of the object. This is what is visible when viewing the object in wireframe mode. Texture: An image that adds surface detail to geometry. Light: A light source node. Sequence: A sequence node will treat each child as a frame in an animation and automatically cycle through them. Occluder: An occluder node can be used to hide all geometry that appears behind it. Switch: A switch node can be used to control the visibility of its children nodes. Level of detail (LOD): Used to swap models (e.g. high poly/low poly) based on the model's distance from the viewpoint. Avatar: Vizard's supported character format. Group: An empty node without geometry used to group child nodes together. Similar to a transform without the overhead of position, orientation, and scale information. External Reference: References an external resource file. This is useful when the external file is a component shared between models. Changes to the shared component can be made in a single file. Text: A node used to display text in the 3D world. The texture pane lists all the textures in the scene. Clicking a texture will display it in the viewport. If the texture contains an alpha channel, you can right-click the viewport and have it render only the RGB or Alpha channel. Expand the arrow sign to the left of the texture to see the object(s) that it's applied to. Dimension: The width/height dimensions of the texture. Size (KB): The memory size of the texture in kilobytes. Format: The pixel format of the texture (RGB, RGBA, ...). Compression: If the texture is compressed, the compression format (DXT1, DXT3, or DXT5). Anisotropy: If enabled, the anisotropic filter level of the texture. The progress bar next to the controls displays the current time of the animation. The values on the left represent the current/total time of the animation in seconds. The values on the right represent the current/total frames of the animation. Clicking on the animation progress bar will set the current animation to the corresponding time. Dragging the mouse will scrub through the animation. Selecting an avatar animation will automatically begin cycling the animation on the avatar. Choosing the [none] animation on the avatar will clear all animations and place the avatar into its default pose. The [all] animation is displayed when there are multiple animations in the scene. Selecting this animation allows controlling all animations simultaneously. The time/frame values represent the maximum duration and frame count of all animations. Certain animations can be expanded to display a list of all instances of the animation within the scene. Select a transform node in the scene graph. Activate one of the transformation modes; Translate (W), Rotate (E), Uniform Scale (R), Non-uniform Scale (R). Use the transform gizmo in the viewport or transform type-in fields in the toolbar to apply a transformation. 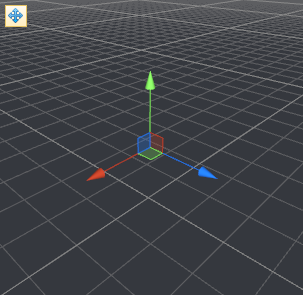 Select an axis control in the viewport and drag with the mouse. Select an axis by clicking one of the small arrow buttons in the type-in field. Then drag up/down with the mouse. From the Create tab in the toolbar select a node type. This will place the new node below the top level scene node. Right click a node in the hierarchy and select Add, Insert below, or Insert above. Cut will place the selected node in the clipboard and remove the node from its parent. Copy will place the selected node in the clipboard without removing it from its parent. Paste Instance will add an instance of the node in the clipboard as a child of the selected node. This will not allocate extra memory for the new node. However, any changes made to the new instance or any of its children, will affect other instances as well. Paste Copy will make a new copy of the node in the clipboard and add it as a child of the selected node. This will allocate extra memory for the new node. However, any changes made to the new copy will not affect the original node in the clipboard. Delete will remove the selected node from its parent without placing it in the clipboard. 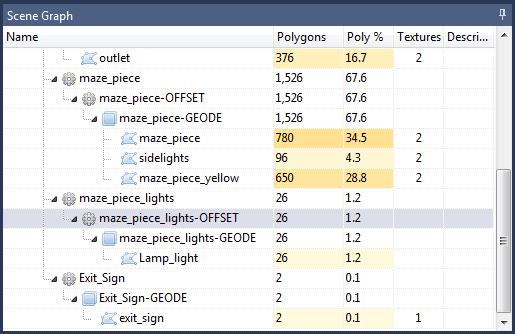 Use the Properties pane to edit the names of nodes in the scene graph and their material properties. Note: Many of the material options access low level OSG properties. These are difficult to manipulate without knowledge of OpenSceneGraph. Displays the length of the smallest grid square. The grid size adjusts according to the viewpoint location. The further away the viewpoint is, the larger the grid size and length of each grid square. Displays the size of the selection bounding box. Displays the position of the selection origin. Effects: Toggles auto-generated shader effects. Animations: Toggles between playing and pausing animations. If the model does not have animations, this control will be disabled. Peek: Toggles peek mode on and off. Peek mode reveals the current selection by graying out the rest of the scene. This can help to clearly identify the sub-part and is useful for viewing parts that are partially or completely obscured. The Node Path toolbar displays the parent hierarchy of the current selected node. Clicking a node item within the toolbar will change the selection to that node. Clicking the arrow next to an item will display a drop down list of all the nodes children. The selected child in the hierarchy will be displayed in bold. Selecting an item in the drop down list will change the selection to that child. 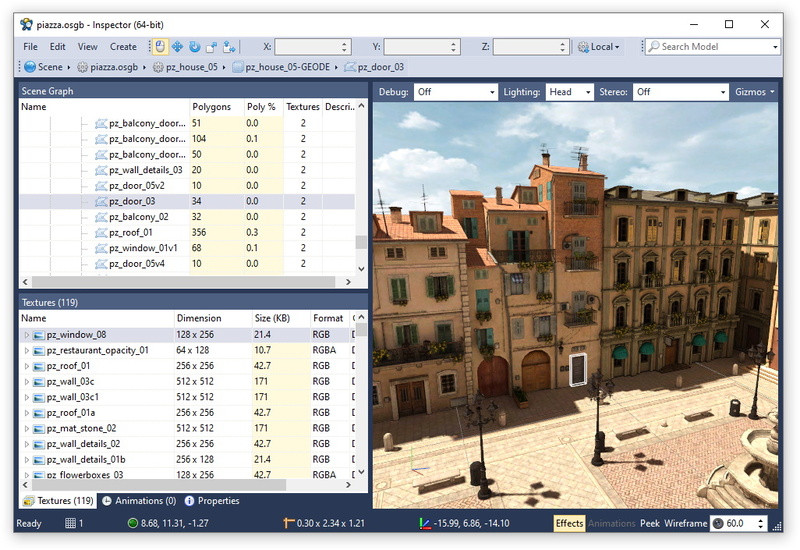 The Search toolbar provides a quick way to search for objects within the model. Use the Alt + D keyboard shortcut to place the cursor inside the toolbar and begin typing your search phrase. As you type, the Find Results pane will be populated with matching node and texture results. Single or double click a node result to select the object in the viewport and show it's location in the scene graph tree. Click on a texture result to display the image and show it's location in the texture pane.